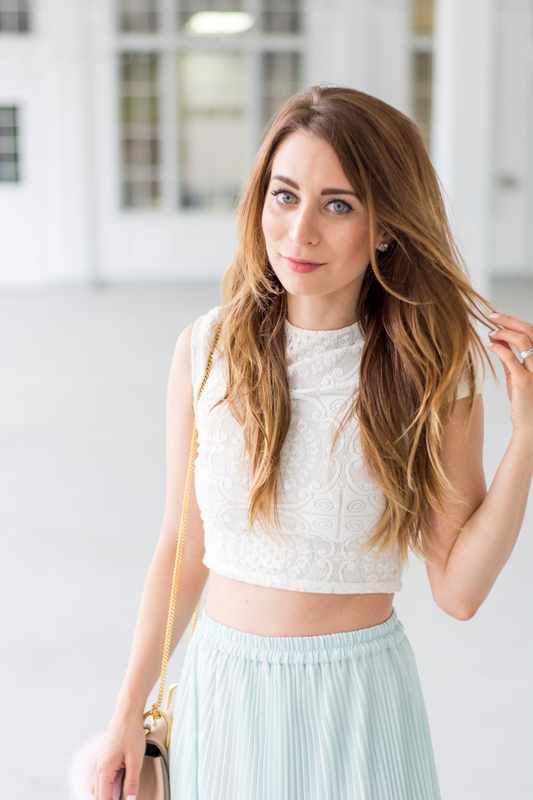 OOTD - Mint Maxi Skirt | La Petite Noob | A Toronto-Based Fashion and Lifestyle Blog. Summer's here, so maxi skirts and crop tops are on the agenda. You guys know that I'm a big fan of this combination simply because it's so simple, comfortable and flattering - yes, even for petites! The fact that there's only a bit of skin showing at your most narrow part makes the maxi skirt and crop top my go-to combo when I've over-indulged over the weekend. This mint maxi skirt from Club Monaco is great for petites - I can actually wear it without heels! Paired with my favourite lace crop top and some simple sandals, and I'm good to go. I just have to take a second to rave about this recently-purchased pink pom pom for my purse. After looking high and low for a purse pom that was fluffy, beautiful, and wouldn't break the bank I finally found one on Etsy. Check out YogaStudio55 if you're in the market for your own Purse Pom. What do you guys think? Are you into the maxi skirts and crop tops, or are you over it? Do you have a hard time finding maxi skirts that fit as well? Let me know! Ah, you look like a pastel dream! I love it. So happy the pics turned out. You are a profesh! Love our photo adventures! Well hello there Disney princess! You look absolutely stunning, this skirt was made for you! Thanks Siffat - I was inspired by your white crepe skirt! I still can't believe that I found a maxi skirt that actually fits!